Arrived back in the UK from a short Malaysia trip to find Autumn in full swing. This also means rutting stags and other delights in Richmond park, just up the road from our gaff. We are very lucky in living a few hundred metres from a small side entrance to Richmond Park. This is a huge, more or less natural park, first set up as the hunting ride of Henry VIII and other kings. The area originally extended over the Thames to what is now Bushy park, and to Hampton Court. It has a large deer population that is seemingly untroubled by the presence of walkers and runners. 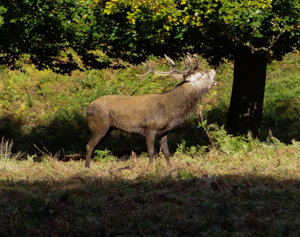 This year the stags seem to be extra hunky. You can hear their roars all over the park – and they are getting ready for jousting with their rival stags – sharpening their antlers on tree branches, and warning off the opposition with macho swaggering. I used the RX-100 for all these shots and it continues to delight me. One limitation of it though is that the optical lens has only got a maximum zoom of 100mm. That’s not long enough to capture a bad tempered stag – I have no desire to get closer than around 50m or so to these very grumpy and intimidating animals. However the camera has a feature called ‘clear image zoom’ – a variant of the usually-despised digital zoom. This version interpolates the missing pixels, to give a crisper view. I used it for all of these shots except the first, and I was amazed at how good it was. The photographs don’t bear pixel peeping, but at this size they are just fine in my view. See what you think. As usual (if you have Flash), the photos are best seen in full screen (press FS in the bottom right hand corner), and in slide show ( press SL). Titles can be seen by pressing the ‘i’ in the top right corner, and to get back here, press ESC. If you don’t have Flash, i.e if you are using an Apple iPad/Pod/Phone, or a Nexus 7 tablet, or any Android tablet running 4.1 Jellybean, you can now see them as well. Just click any of the thumbnails and a full screen slide-show should start. In the next post I’ll cover some recent news on the RX-100.